Your clients want to get their financial information from you. But they will look elsewhere if you do not provide the information they want. Spectrem’s new wealth segmentation study Using Social Media and Mobile Technology in Financial Decisions examines the attitudes and concerns investors have regarding social media websites, retrieving financial information through technological advances such as smartphones and tablets, and how their relationship with their advisor is affected by modern technology. Investors want financial information. They want to read articles on financial matters, they want to watch videos of investment experts, and they want to be able to check their investment account balances. They are willing to do all of those activities at their advisor’s website if that website makes those types of information available. Although interest in watching videos is growing among investors, reading articles is still the favored manner for acquiring financial knowledge. There are two forms of reading available to investors these days: articles and blogs. Among Millionaires with a net worth between $1 million and $5 million, 26 percent are interested in reading blogs from trusted financial advisors, according to the Spectrem study. That includes almost half of the Millennials questioned for the report (and those Millennials have an average net worth of over $2.4 million). Among all Ultra High Net Worth investors with a net worth between $5 million and $25 million, 30 percent are interested in reading blogs from financial advisors. Do you have blogs on your website, written by your staff or contributed by trusted colleagues? More than one-third of Millionaires have interest in reading articles or research on financial topics and products. 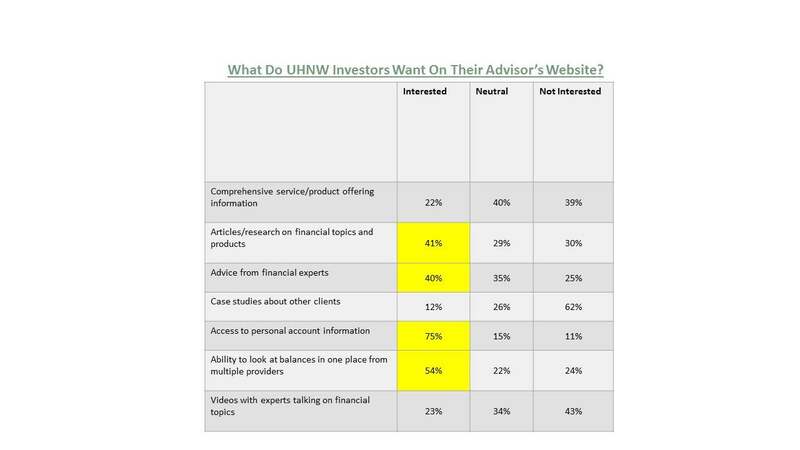 Thirty-four percent want to get advice from financial experts on the website of their provider or advisor. Perhaps you have clients who no longer get their information through reading but prefer to access videos for financial information, tips or instruction. Does your website offer that service as well? Again among Millionaires, 32 percent watch videos on financial websites, including those of their advisor as well as media sites such as CNBC or FoxBusiness. Among those that watch videos, 73 percent go for general financial information clips, while 50 percent look for videos discussing current financial events. Almost half watch videos of financial commentators. That’s an audience your firm is either attracting with the videos you present, or it is an audience you are ignoring because you do not offer such media on your website. Investors want even more from your website. They really want to be able to access their personal account information (70 percent) and approximately half want a series on online tools for assessing their retirement plan and allocation of assets on the website of their financial provider or advisor. Providing this information to investors is a way to educate the investor regarding current financial events, investment products and services, and matters that can affect their portfolio. An investor who reads an article or blog or watches a video can be urged to pick up a phone or send a text or email to his or her advisor in reaction to something they read or hear on your website. But that will only happen if you have that information available to them on your site. There are other places they can go to get similar information, but that’s not a good marketing strategy. When it comes to information delivery and receipt in the modern world, every day is a new day. Investors want constant updates, and they want to be able to acquire those updates in the manner they choose. It is up to financial providers and advisors to provide that information on their website to keep their clients happy and to attract new clients.